Trees are so cool! Not only do they provide shade and oxygen but many other benefits as well. From reducing energy use and improving water management to providing wildlife habitats and improved well-being for humans, trees are an important and necessary asset to our lives and communities. We can help you reap some of these great benefits in your yard. Join us on any of the other dates listed below, to Adopt-A-Tree of your very own! 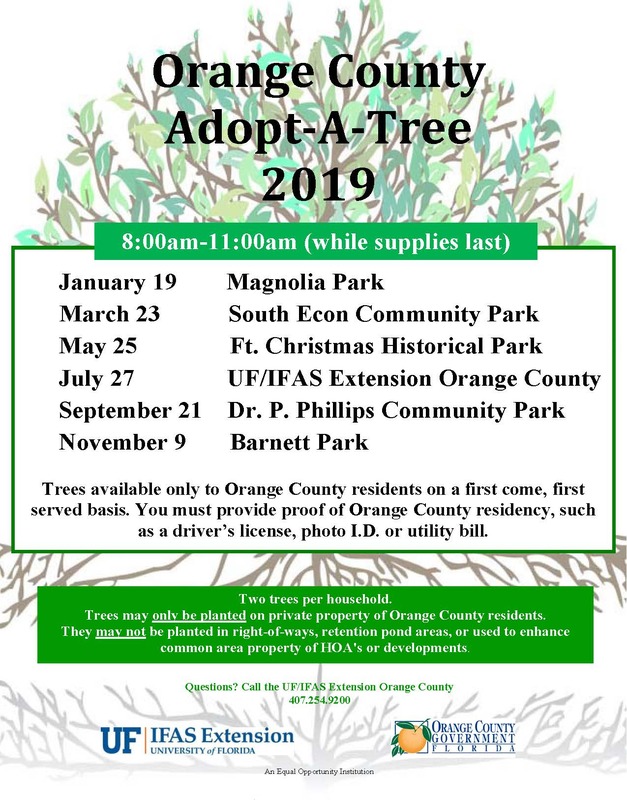 These events are open to all Orange County residents with proof of residency on a first come, first served basis starting at 8:00am until trees are gone or 11:00am, whichever comes first. Each household is eligible to receive two trees, and the trees must be planted on resident’s private property only. Tree varieties will vary based on availability but all will be suitable to flourish in Zone 9B. Come see us, pick up your new trees and start digging their benefits immediately! Richard Tyson is the Director of the UF/IFAS Extension in Orange County. He received his PhD in Horticultural Sciences and MS in Vegetable Crops Production from the University of Florida.